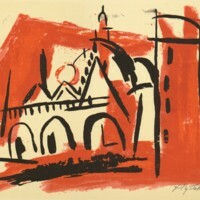 Leonard Pytlak (1910-1998) was a printmaker who was born in Newark, New Jersey. He studied at the Newark School of Science and Industrial Arts and at the Art Student League in New York. His work is among numerous museum collections, including those of the Smithsonian and the Museum of Modern Art. He lived, worked, and exhibited in New York City until his death in 1998.